Web pages with video are 50 times more likely to end up on the front page of Google. In short, a video increases your chances of being found by Google, makes clients more likely to visit your website, keeps them on your site longer and moves them to action more often. One of the biggest video mistakes small business marketers make is jumping in without a plan. Every single video you post about your business should be part of a targeted marketing campaign. You need to ask the same questions you’d ask about any other type of marketing you want to do. Knowing what you want to accomplish makes it easier to decide everything else about your video project, from video style to distribution channel. Bone up on the various types of video content that are popular in online video marketing: explainer videos, intro videos and instructional videos are just a few of your options. Get to know the various video distribution channels, from YouTube to your affiliate bloggers. Who reads them? Who shares on them? What’s their reach? Which ones are right for your goal? Decide on the story you want to tell and make sure you stick to it. More about this later. What you think your customers want to know and what your customers want to know are often two very different things. Most business owners have a bit of a problem with tunnel vision. They’ve forgotten to think like customers. Customers all want to know one thing: What Can You Do For Me Today? If your video doesn’t answer that question, you’ll lose viewers – and sales. This is where the concept of telling a story comes into play. Imagine your prospective customer sitting at home without your product. What can you do for him? How do you make her life easier? What will be better if they use your product or engage your service? The more you understand what your customers want and need, the more successful and effective your video marketing will be. Your online videos represent your company – forever. The persistence of the Web is something few business owners consider. Once you post something online, it never really goes away. That’s something to consider before deciding to produce your own video in-house. That doesn’t mean that you have to pony up thousands for a professionally produced video, especially if you’re a small, local business. It does mean paying attention to the hallmarks of video quality. Good sound is vital. Invest in a real microphone if you’re doing voice-over or narration. If you shoot live video, get a tripod. A shaky camera screams amateur. Consider screencasting and simple animation instead of live action. There are great tools to make it easy for DIYers to do a professional job. One way to cut your video viewers in half is to send people somewhere else to watch it. Choose a video platform that you can embed anywhere. Embeddable videos are easier to share and distribute, so people are more likely to share them. In addition, choose a video platform that’s viewable in as many browsers as possible. For now, that means making your video available in more than one format so that your visitors can view it no matter what player is available on their computer. The last thing you want to do is make a visitor download a player in order to watch your online video. Don’t forget mobile platforms. With the rising popularity of tablets and media readers like the Kindle Fire and the Nook, more and more people are viewing video content on their mobile devices. Make sure that you optimize for them. Where are you going to put your video when it’s finished? The more channels you use for distribution, the more likely it is that you’ll achieve your goal. Here are just a few of the many distribution channels at your disposal. YouTube, of course. Even if you choose a different video hosting service for your video, there are plenty of good reasons for also hosting it on YouTube. Among them: YouTube is the second largest search engine on the web. Your website. Whether you put an intro video on your home page or host a series of how-to videos in their own section, your website is an obvious distribution channel. Email is often overlooked as a video distribution channel, but it shouldn’t be. In fact, including videos in an introductory email increases the click-through rate by as much as 400%. Facebook Pages let you share videos from numerous video sharing sites as well as upload your own video from your computer. If you’re not already doing this, you really should be. As of November, 2011, Facebook was the second-largest referrer of traffic to online media sites. Even more importantly, people are more likely to watch videos shared on Facebook all the way through. Affiliate marketers are always looking for content for their websites. Make your video available to your affiliates and share it with non-competing related businesses to increase your reach. More information, that is. Don’t overload your video with details – and do keep it short. 60 to 90 seconds is optimal – the further you go past the 2-minute mark the more likely you are to lose viewers. Few people will stay engaged with a talking head for very long. If you want your audience to be engaged, you need to be engaging. That calls for a little creativity. Here are just a few ways that you can add interest to your videos. Tell your story with animation. Insert slides and graphics to help viewers visualize what you’re talking about. Make an emotional connection with your viewer through identification. A video that says, “We feel your pain” can make a powerful impression. Add appropriate music. Never underestimate the power of music to move your audience where you want them to go. Story is everything. Use your video to tell a story about your viewer or your product. Your story should have a beginning, a conflict and a resolution – starring you or your product, of course. Products in pretty packages sell better than those in a plain brown wrapper. The preview screen is the video equivalent of product packaging. Go through your video and find a screencap that’s engaging and interesting, and use that as your preview screen. The more interesting you make your preview screen, the more likely it is that a site visitor will click on the Play button. Your job isn’t done when you post your video. 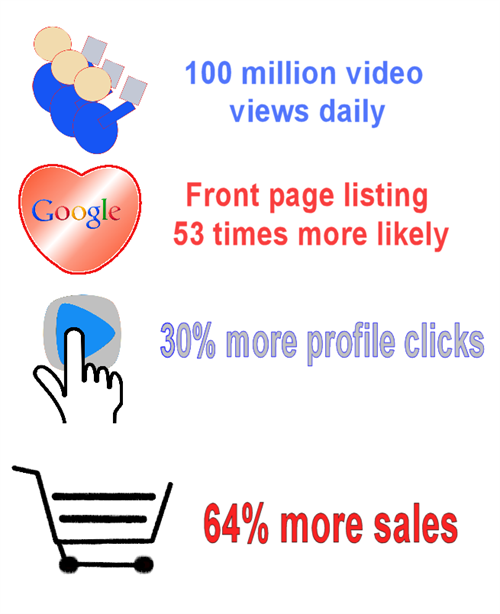 You can track the stats on your online videos just as you do with any other marketing campaign. Most video hosting sites provide video analytics to help you understand who’s watching your videos, how they share them, where they watch them and how engaged they are while watching. Repeat what works and avoid what doesn’t. Remember Your Call To Action! It’s not enough for you to know what you want your audience to do after they view your video. You have to tell them to do it. Until recently, your video call to action was confined to showing your website address or telephone number in your video, but technology is ever-evolving. Make it easy for your viewers to take action by including clickable links in your videos on YouTube or by wrapping your video in a third-party overlay like Viewbix. Here are just a few of the calls to action you might include in your video. Online video is here to stay, and it’s only getting bigger as time goes by. As more and more marketers adopt video, it’s going to be harder to stand out among the crowd. Use these techniques to leverage your online marketing videos to stay ahead of the pack.